June 2019 provides us with the very last opportunity to organize Daks over Normandy and to honour those who have paid so much to liberate Europe. Daks over Normandy will be a once in a lifetime event. 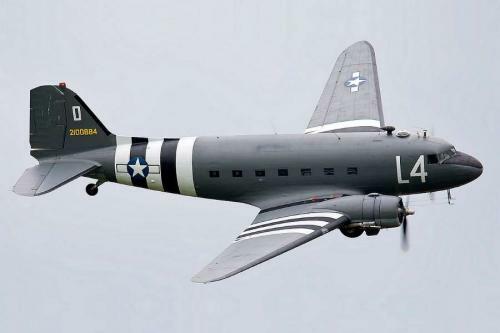 The skies over the United Kingdom and Normandy, France will be filled with Douglas DC-3/C-47 Dakotas and hundreds of Paratroopers. For the first time since World War II will this many of these magnificent aircraft be assembled in the very place where they saw their finest hour. From 2 to 9 June 2019 over thirty DC-3/C-47’s will come together. Their owners and operators fly them in from all over the Globe. From Scandinavia, The Netherlands and the rest of Europe, from Canada and the United States and even from as far away as Australia. All for what may well prove the very last time. Just so everyone can watch paratroopers jump over Normandy once more and admire these wonderful aircraft on the ground and in the air, where they belong. and from 5 to 9 June at Caen Carpiquet Airport in Normandy, France! Both locations where carefully chosen because of their facilities and their infrastructure and because of their World War II heritage.